Small, sleek and budget? Can LG really pull this off? The LG Optimus L3 is a budget Android handset that takes its design cues from the brand's higher-end models, but has it got a performance to match? The LG Optimus L3 is the brand's attempt to hit the budget Android market in style and, at the first hurdle, it manages to beat both the Samsung Galaxy Ace and Huawei Ascend G300 from the very first glance. The design is slick, palm-sized and even manages to take a couple of design flourishes from the LG Prada 3.0. For a £99 phone, that's quite an achievement but it's the insides that count too. Has LG managed to offer a decent spec for the money and, often an LG failing, the overall user experience? It's fair to say that the LG Optimus L3 is one of the best looking budget Android phones out there. Yes, it's plastic and has a big LG logo on it but, really, LG has made big steps towards a premium style without aping any rivals as other brands have been known to do whenever Apple releases a new smartphone. The palm size dimensions - 102mm x 61.6mm x 11.7mm - mean that it really is pocket sized and hits the mark where style and convenience converge. The 3.2 inch screen goes close to the edge without looking out of place and, overall, it's a pretty impressive piece of design to hold and stare at. As the first model of the LG 'L' range, it's a great start and genuinely beats any smartphone to arrive from Samsung in the last couple of years. The physical button at the bottom of the smartphone reveals the illuminated Android buttons which is a nice touch. 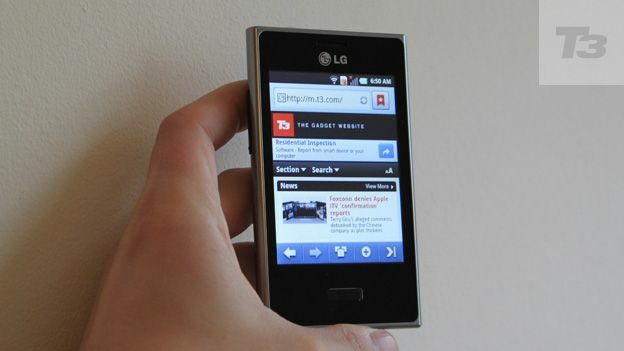 All of this signals good things for the forthcoming LG Optimus L5 and LG Optimus L7 smartphones. Full black and Soft white are the two colours available at launch but more will follow. There's a 3 megapixel camera, 1540 mAh battery, acceptable screen and fast browser. During use, there's an easy to use interface and LG hasn't meddled with Android too much, using Optimus UI 2.0 Lite on top of Android Gingerbread and resisting the urge to add bloatware or needless apps. The 32GB MicroSD expansion option is welcome and playing a few 320kps tracks was simple and the sound quality on a par with mid-range rivals. Facebook and Twitter produced fast results. LG admits this is an entry level fun phone for social networking, music and calls and it nails them all. 8GB of memory would have been a bonus alongside a better , 5 megapixel camera but, as it stands, the 1GB storage and 3 megapixel camera is an acceptable sacrifice to own a £99 phone which you won't be embarrassed to reveal in the pub. A 3.2-inch screen is hard to accept in the world of high-end smartphones but if this is your first step into the land of smartphones, you won't be bothered about size. The 320 x 240 pixel resolution is harder to accept for constant browsing but a 3.2 inch screen is never expected to deliver Apple's Retina display levels of resolution. Clear, well designed apps like Facebook and Twitter run well. Games less so, but, again, the screen has been built with a budget in mind and is low resolution for a reason. The forthcoming BlackBerry Curve 9320 manages the same 320 x 240 on a smaller screen for £149 SIM free. The display is bright and viewing angles good, however, so emails and larger chunks of text or photos with a large image in the foreground are easy to view. The 800 Mhz processor is low by smartphone standards but it's never asked to do that much in terms of powering a high resolution screen or a bigger, better camera. Android Gingerbread works well and though there's a lack of storage, the LG Optimus L3 manages to punch above its weight in terms of the low spec processor. Call quality is good, although the size of the phone against your ear may feel small if you're used to a larger phone, smart or not. The 1540 mAh battery is the star specification here, offering well above a day of intense use - we managed 2 full days with push email and 3G and Wi-Fi turned on. The smaller screen and low power processor help but kudos to LG for bridging the gap between simple and smartphone battery life while keeping the phone lightweight at 110g. The new, dual-core Galaxy Ace features the same battery so this gives you an idea of how much a bonus the battery actually is. A capable budget phone which wins in the style stakes. If you want music, Facebook and a responsive keyboard and low megapixel camera, this is a great phone that really only misses out on a four-star rating due to the slightly lame screen resolution.